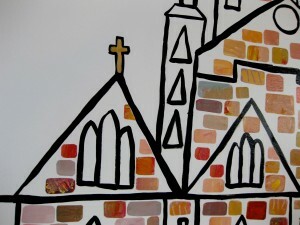 I’ve just finished a big mural project at St Paul’s C of E Primary School in Hook, near Chessington. 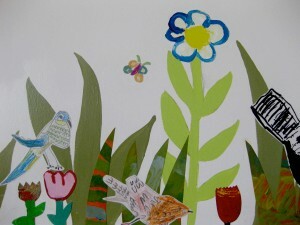 The project began with three days working with the whole school, class by class, creating colurful birds, leaves, flowers and buildings using a variety of media from acrylic to collage and coloured pencil. 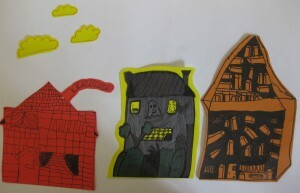 Other year groups experimented with colour mixing to create dozens of different shades for bricks and leaves, year 4 drew beautiful birds and year 6 worked in groups to make large collage/drawings of key buildings in or connected to the area, including Southwark Cathedral as a focal point. 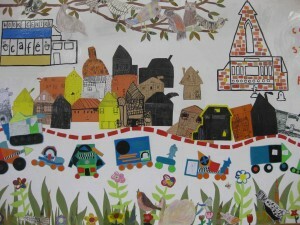 I painted their drawings onto the boards and collaged on the cut out bricks, then added all the richness of bird and plant life, as well as the homes and vehicles that the children created (including an unfeasibly large number of tanks!). It’s the third time I’ve worked at St Paul’s and it was lovely to recognise so many children and to see how their creative work has developed over the years. 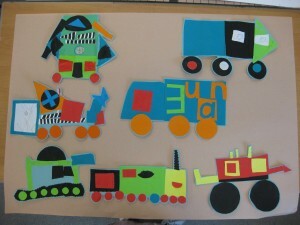 This entry was posted in General news, murals, Workshops on October 5, 2011 by Jane Porter.